Mini Thai Basil Turkey Lettuce Cups with Garnishes of Jasmine Rice, Poblano Pepper, Oyster Sauce & Chiffonade of Basil. This recipe was an instant hit with my family. Everyone loved it except one boy who still refuses to eat anything green. (We are working on this!). This dish is as fun to eat as it is to make. 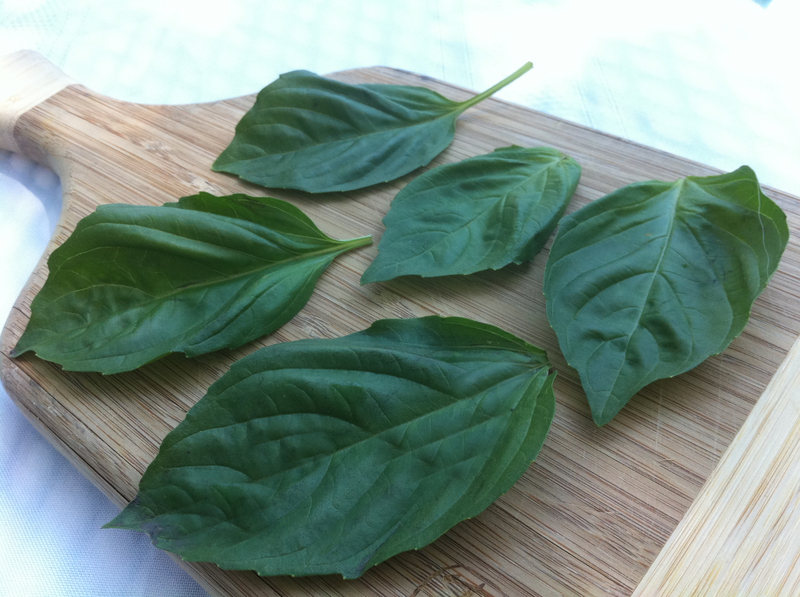 The fresh basil wonderfully balances the slight heat of the poblano pepper. 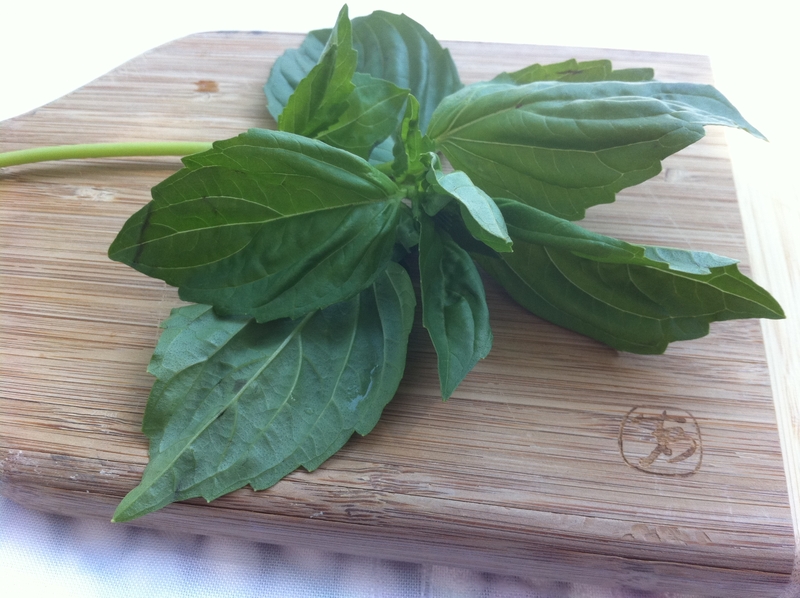 My local Dominick’s grocery store carries a large container of organic basil that works well. Be sure to use the full cup of basil. The herb-infused sauce is what gives the dish an authentic Thai flavor. It’s easy to make and because it can be prepared in under 30 minutes, it is a go to dinner for us on busy week nights. I’ve used Boston Bib, Romaine and Iceburg lettuce to wrap the filling. Iceburg lettuce is the easiest to wrap and its mild flavor allows the flavor of the filling to shine through at its best. With a few substitutions this dish could be made vegan. I have a friend who wants to try it with tofu and I know that there is a mushroom version of oyster sauce that will hit upon the same earthy notes. Can’t wait to hear how it turns out for her and you! *Dash of cayenne pepper but only if you like things spicy. Heat oil and red pepper flakes in skillet over medium high. Add poblano pepper and saute for 5 minutes. Next add garlic, saute for 30 sec. Add ground turkey and stir fry, breaking meat up into small pieces, until cooked through, about 10 minutes. Combine brown sugar, oyster sauce and soy sauce. Pour over ground turkey mixture. Cook for 5 minutes. Add basil and cook for 2 minutes. Transfer turkey to a serving bowl; serve over jasmine rice or wrap filling & jasmine rice into lettuce leaves. Thai Basil Turkey Lettuce Cups with Jasmine Rice & Poblano Pepper Garnish. 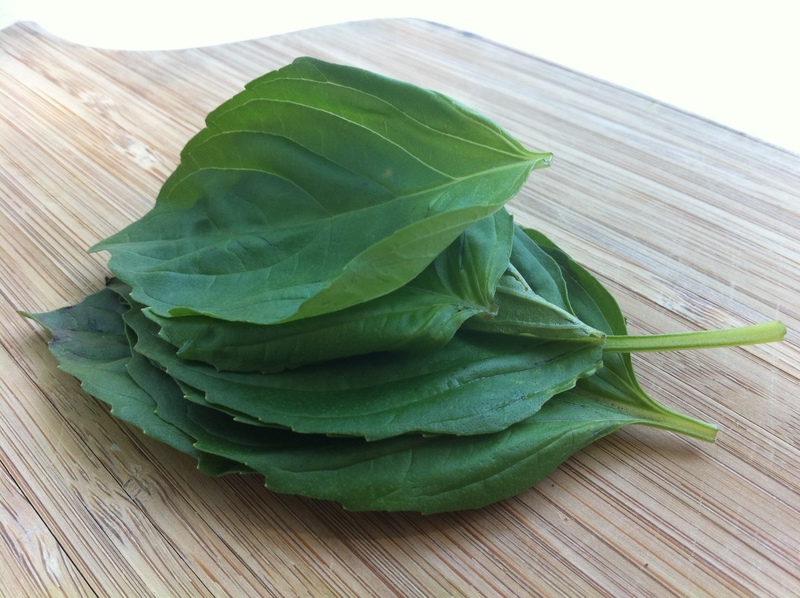 *Chiffonade is a knife technique of french origin used for cutting herbs like basil or sage into fine strips or ribbons. It’s easy to do and makes quick work of chopping a mound of herbs for garnish or your favorite dish. Just wash, separate and stack the leaves of your herb. Roll into a cigar-shaped cylinder. And finally with a very sharp knife, cut small cross sections and Viola, ribbons. (Be sure your knife is sharp because a dull knife will crush your herb and it will turn black). 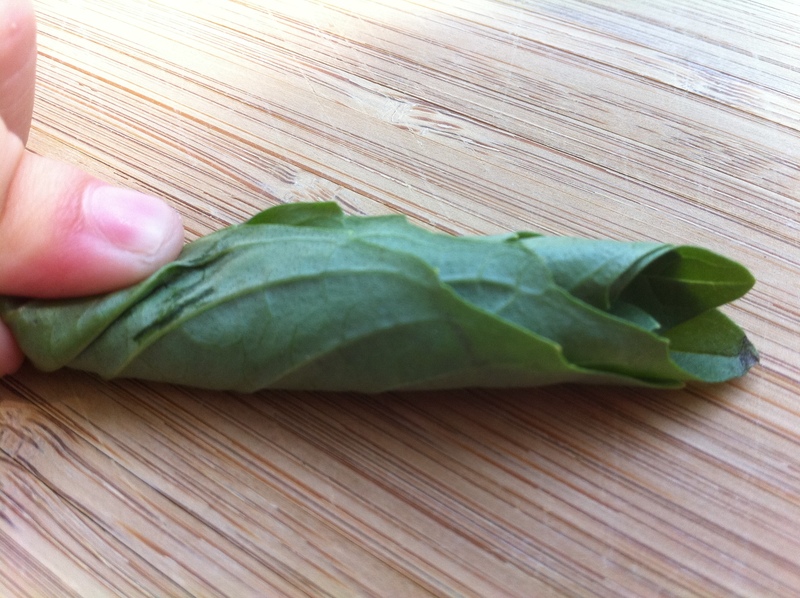 My young son had fun helping me roll the basil for the photographs below ; ). Recipe by Jackie Burke (with modifications) and found in the Daily Herald.